Destashification Make-Up Bag, Part 3: The ZIPPER! But putting one in a project can stop some needleartists in mid-seam! The second side of the lining of the Destashification Make-Up Bag has a zippered pocket. But relax…it is sewn in without basting, tears, or frustration. Just follow these steps. 1. Cut one mushroom from the second fabric scrap. This piece will be the inside pocket. It will only show when the pocket it opened. 2. 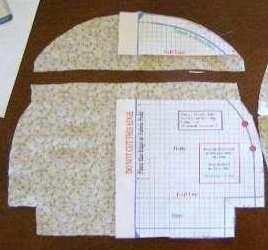 Cut the pattern piece in two along the upper fold line. Fold lining fabric once and press. 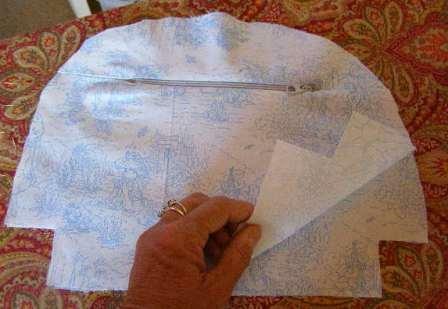 Place pieces with left side along fabric fold and 1.5″ between the upper and lower pieces. Pin in place. Cut out pieces along upper, right and lower edges. Cut between the two pieces dividing the 1.5″ in half. This will provide 3/4″ seam allowances. 3. Sew the upper piece to the lower piece leaving the middle section open. 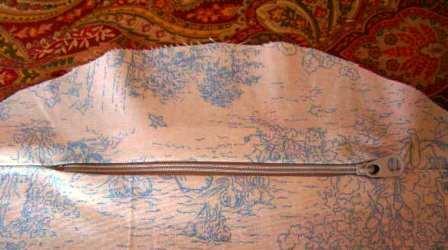 The seams should be approximately 2″ long on the left and right side, but the middle (length of zipper) is not sewn. 4. 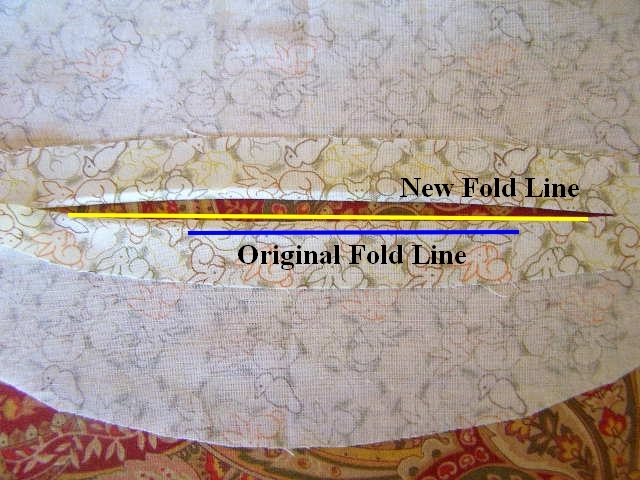 Fold along seam and press open (blue line in photo). 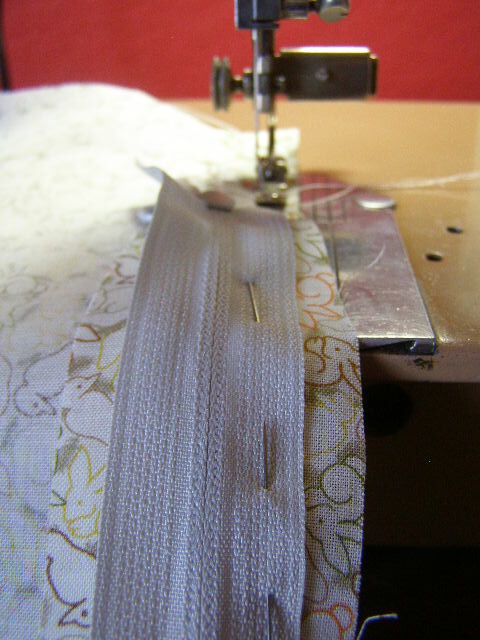 Then pull the seam open just a bit more (yellow line in photo) and press again. 5. Place zipper in the opening. 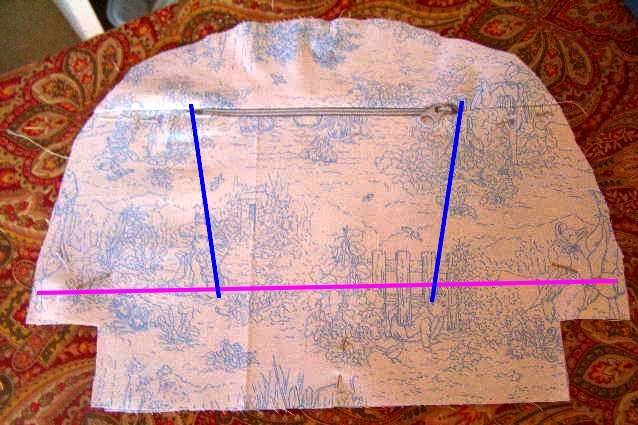 Pin the right side of the zipper to the seam allowance that extends beyond the “new” fold line. 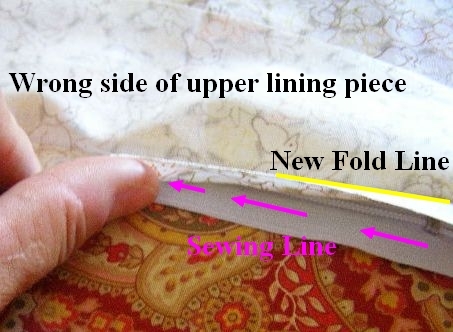 Do not pin the right side of lining – just the seam allowance. 6. Sew as shown in photo. The seam will be approximately 1/4″ from the zipper teeth. 7. Sew a second zipper seam closer to the zipper teeth. 8. Repeat with the other side of the zipper. Try the zipper! 9. Place the lining piece on top of the scrap fabric mushroom (inner pocket). The right sides of both pieces should be up. Fold the “mushroom top” of the lining piece down to expose the seam where the zipper was sewn in. Stitch again along the same seam line to secure lining to inner pocket. 10. Press lining top up. Pin lining to inside pocket (scrap mushroom). 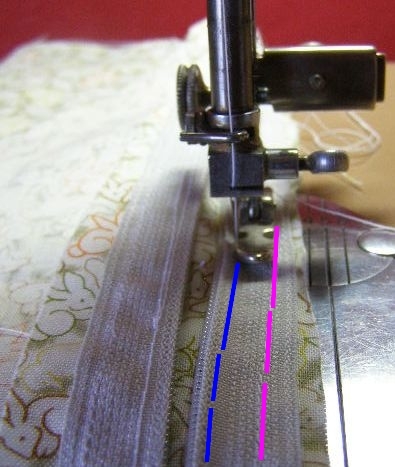 Sew lines from ends of zipper to base as shown. 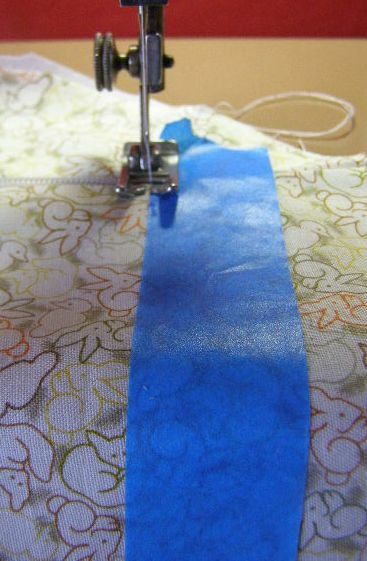 Using tape will help produce straight seams. 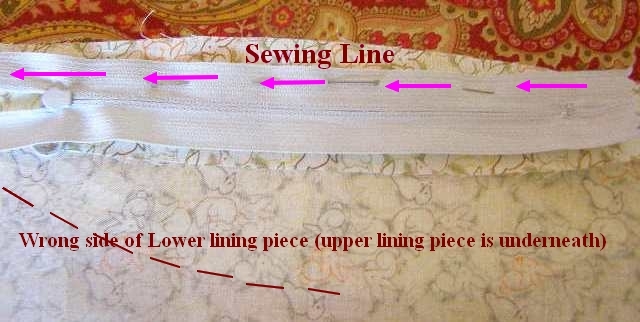 Sew along lower fold line. These seams will make the pocket smaller, but prevent smaller cosmestic items from being lost in the corners when in use! Using tape will help keep the seams straight. ……and the second lining piece is now complete! Next: Completing the Cosmetic Bag! This entry was posted in Accessories, Purses, Sewing, Sewing for a Teenager, Tutorial and tagged How to Sew in a Zipper, Purse Zipper, Tutorial, Zipper. Bookmark the permalink.